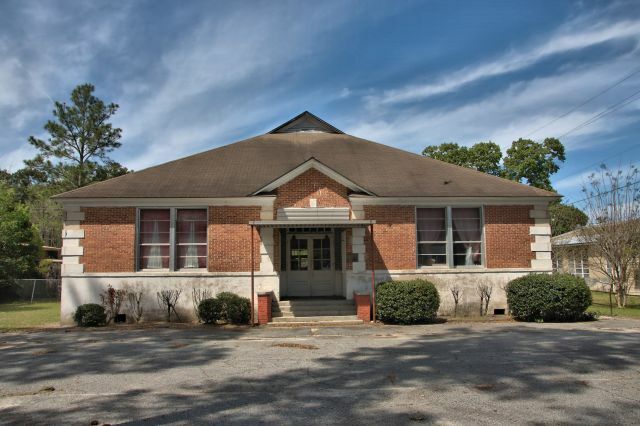 According to the National Register of Historic Places nomination form (1986): The Lanier County Auditorium and Grammar School is significant as an unusual and distinctive example…of eclectic early 20th century architecture. The compact, regular massing of the buildings, the use of brick, and details such as quoins, keystoned arches, and pedimented front entryways suggest traditional, institutional Georgian Revival architecture. However, these elements area handled in a free, non-traditional way that reflects a contemporary early 20th century design approach…These architectural characteristics result from the fact that the buildings were designed by Lloyd Greer (1885-1952) of nearby Valdosta, Georgia, a highly trained, versatile architect known for designing many other schools, public buildings, and private homes throughout the South Georgia and North Florida area. The buildings are…the only remaining facilities associated with the county’s first consolidated school system. The county was created in 1920, the same year the city and county schools began consolidation as part of a statewide movement toward consolidation. After this consolidation took effect, more school space was needed and thus these two buildings were built in 1925 to augment the existing Lanier County High School. The auditorium has served many county groups as a meeting space since it was the largest meeting space in the county. The loss by fire of the pre-existing Oaklawn Academy/Lanier County High School building in 1950 left these two structures as the only representatives of this early Lanier County educational effort. This is not the Auditorium, but rather the High School building. The Auditorium is now known as the Threatte Center and sits on Lakeland Valdosta Highway.